If you didn't catch this link on Facebook or Twitter - Check out this post on the Hero Blog!!! What a great thing to see...we know this happens thousands and thousands of times, with thousands and thousands of families. But to see it all wrapped up in one little card....well that is just amazing. 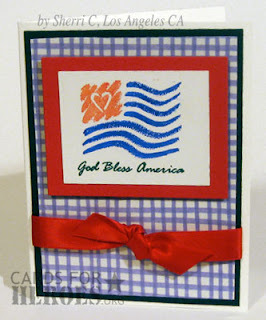 We're hoping to find the cardmaker responsible for that beautiful card—if it's you, please email and let us know! 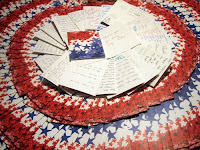 Also, if you're the recipient of one of our cards—whether a family member, friend, supporter—please let us know. 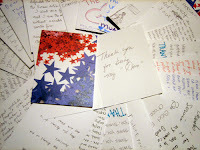 Our cardmakers LOVE to hear the impact that one little card has; it gives everyone motivation to continue on! This video explains a little of why we ask for no glitter....these guys can't get rid of a mess on their uniform, and glitter can make them visible to night vision goggles. Yikes! 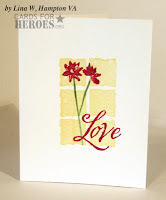 Lina's sweet cards prove that the old principle is true — simplicity is beautiful! (And Lina, from all of us - thank you to your family for your service to our nation! 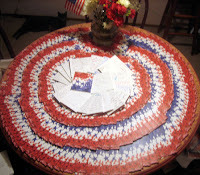 How long have you been making cards for our heroes? 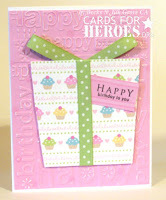 I started stamping for Cards for Heroes maybe before Christmas of 2008 or the new year of 2009. I can't really remember. As soon as I found out I wanted to do it. Quick ones! I would try to copy other stuff I would see and it would take too long or I was not happy with it. Now I just want to make a card that will not take me 2 hours and I can just be happy and move on to the next one. Are there colors, style, or products that draw you? I LOVE the new clear stamps. They are my favorite. Less mistakes and less waste. 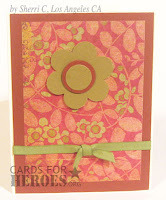 I love florals and stamps that have meaningful quotations. I am a military spouse and know what it feels like to be apart from your loved ones. I feel a connection with the spouses and the the heroes that are overseas! eNewsletter: Next week is the start of August, and we hope that will start to feel like an exciting week for you....week 1 is when our eNewsletter will be coming out each month! Hope you've already signed up - get your friends to do so as well, so they can be in on the latest news! Showcase to Ideas: We've been asked to submit some projects for the Showcase to Ideas website and newsletter. If you have something to share, feel free to submit one to them too! 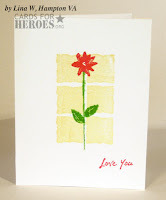 They gave us liberty to mention CFH to get the word out—so you're welcome to tell them you're one of our cardmakers and get another link published too! 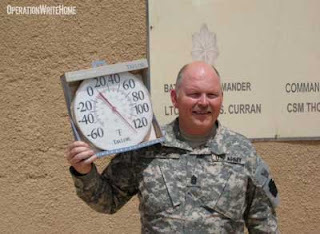 No Hallmark in Baghdad - Article on CFH in Examiner! Many thanks to Michelle Vocke for covering CFH in this fantastic article! Meet two sisters with a lot of talent...thank you ladies for all you do for our heroes! 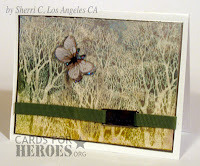 Check out the latest uploads in the Card Gallery to see more of their beautiful cards. ETA: **Additional trivia - they share the same August birthday - two years apart! Marilea -- married to a graphic artist. 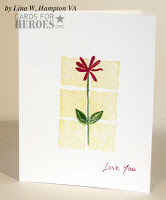 He is very supportive of her hobby and sometimes helps her with color combinations. I work for the State of California as a Office Manager so making cards is a good stress reducer. Becky -- married to a retired cartographer. He is also very supportive of my hobby. I teach second grade. I get my students involved by writing Dear Hero letters (Knowing how to write a friendly letter is one of the Language Arts standards for second grade.) I also think making cards is a great stress reducer. Marilea — I've been making greeting cards for about 10 years. Over the years, I have collected a lot of rubber stamps, paper and embellishments. 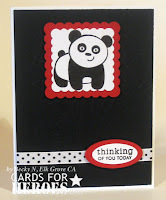 Becky -- -I've been making greeting cards for about 11 years. 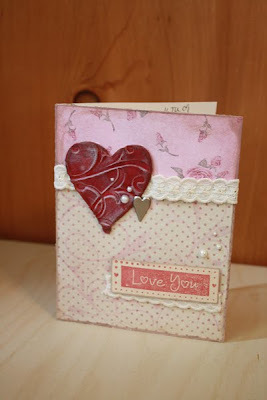 Over the years, I have collected lots and lots of rubber stamps, paper and embellishments. Who needs a guest room when you can have a craft room? Marilea and Becky -- About 9 months. 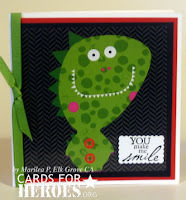 Marilea — I like to make fun fast cards that utilize embellishments. 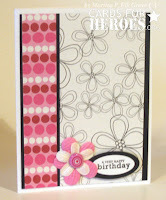 Becky -- I like to make fun fast cards that utilize embellishments (agree with Marilea) and whatever types of cards are needed. Colors, style, or products that draw you? Marilea -- Clean designs and love Amuse and Papertrey Ink stamps and October Afternoon, Cosmo Cricket, Basic Grey, American Crafts paper. I'm addicted to paper!!! Becky -- Same as Marilea, but I'm also addicted to ribbon, the Cuttlebug and chipboard letters and shapes. I also couldn't live without my ATG tape gun! Marilea — It makes me feel good that I can create something that brings a smile to a hero's family member or friend. Becky -- When I read the Hero blog I tear up from the good cheer it brings. It's fun to get together with my sister and figure out the types of cards we want to make. This hero was deployed with a unit we supported...and losses like these make the work we do that much more urgent. Let's help them all keep in touch with home. 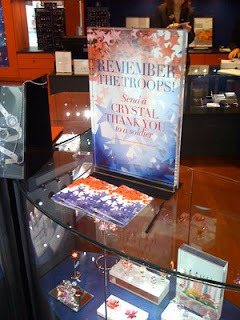 Remember the National Cardsigning that took place at Swarovski Stores across the USA? Well they've been arriving at our shippers' mailboxes! 2,300 so far! Pictured are just some of them....way to go, America! Cards are going out in our boxes....some in smaller quantities as they fit in with the blank cards (as pictured below), and some will go in higher quantities to some of our units. I'm retired and have a garage full of cardmaking/scrapbooking supplies. I don't know for sure. This last batch is my second! How did you find out about CFH? On the internet. Haven't a clue what I was looking for - it must have been a link from a link from a link. I do tend to wander around the internet at times. One that uses up the scraps on my table. They're usually the best ones. Not particularly. I watch UTube a lot and see all kinds of techniques and tools. When I see something I like, I go in the garage and try it out. I love punches and die cuts. It gives me a reason to make cards. I can't stop buying supplies and I can't stop making cards, so to have a place to send them makes me very happy. Especially to the troops. CFH has been commended by the Army! 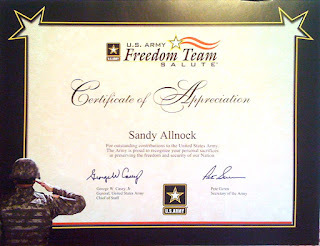 Though the packet came to Sandy's attention, the honor goes to all the CFH cardmakers and donors who have given so sacrificially to our nation's deployed heroes. Congratulations to you all! 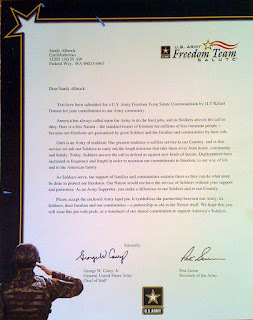 You have been submitted for a U.S. Army Freedom Team Salute Commendation by 1LT R.D. for your contributions to our Army community. America has always called upon the Army to do the hard jobs, and its Soldiers answer the call to duty. Ours is a free Nation — the standard-bearer of freedom for millions of less fortunate people — because our freedoms are guaranteed by great Soldiers and the families and communities by their side. Ours is an Army of tradition. Our greatest tradition is selfless service to our Country, and in that service we ask Soldiers to carry out the tough missions that take them away from home, community, and family. Today, Soldiers answer the call to defend us against new kinds of threats. Deployments have increased in frequency and length in order to maintain our commitments to freedom, to our way of life and to the American family. As Soldiers serve, the support of families and communities sustains them so they can do what must be done to protect our freedoms. Our Nation would not have the service of Soldiers without your support and patriotism. As an Army Supporter, you make a difference to our Soldiers and to our Country. 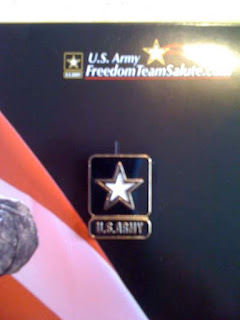 Please accept the enclosed Army lapel pin. It symbolizes the partnership between our Army, its Soldiers, their families and our communities — a partnership as old as the Nation itself. We hope that you will wear this pin with pride, as a statement of our shared commitment to our Soldiers and to our Country. Okay, I need to rant. I was just watching the news, and I caught part of a report on Michael Jackson. As we all know, Jackson died the other day. He was an entertainer who performed for decades. He made millions, he spent millions, and he did a lot of things that make him a villian to many people. I understand that his death would affect a lot of people, and I respect those people who mourn his death, but that isn't the point of my rant. Why is it that when ONE man dies, the whole of America loses their minds with grief. When a man dies whose only contribution to the country was to ENTERTAIN people, the Amercian people find the need to flock to a memorial in Hollywood, and even Congress sees the need to hold a "moment of silence" for his passing? Am I missing something here? ONE man dies, and all of a sudden he's a freaking martyr because he entertained us for a few decades? What about all those SOLDIERS who have died to give us freedom? All those Soldiers who, knowing that they would be asked to fight in a war, still raised their hands and swore to defend the Constitution and the United States of America. Where is their moment of silence? Where are the people flocking to their graves or memorials and mourning over them because they made the ultimate sacrifice? Why is it when a Soldier dies, there are more people saying "good riddence," and "thank God for IEDs?" When did this country become so calloused to the sacrifice of GOOD MEN and WOMEN, that they can arbitrarily blow off their deaths, and instead, throw themselves into mourning for a "Pop Icon?" I think that if they are going to hold a moment of silence IN CONGRESS for Michael Jackson, they need to hold a moment of silence for every service member killed in Iraq and Afghanistan. They need to PUBLICLY recognize every life that has been lost so that the American people can live their callous little lives in the luxury and freedom that WE, those that are living and those that have gone on, have provided for them. But, wait, that would take too much time, because there have been so many willing to make that sacrifice. After all, we will never make millions of dollars. We will never star in movies, or write hit songs that the world will listen too. We only shed our blood, sweat and tears so that people can enjoy what they have. 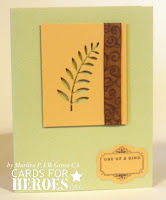 "So that others may live..."
Stampin Up! demonstrator Jan Kreidler is holding a FUNDRAISER! 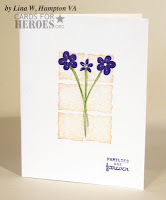 She's picked a start and stop date that each honor two heroes: Start of the sale is July 10th, her soldier son's birthday; the end of the sale is August 9th, her marine nephew's birthdays! 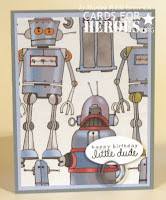 Celebrate a couple of heroes and buy that stamp set you've had your eye on - and 10% of profits will be donated to CFH! Shop shop shop - and help us get some boxes shipped out to our heroes! If you already signed up and received the eNewsletter, you do NOT need to sign up in the pretty red box below. If you did NOT get it, please do sign up! Also, we're gathering an additional email list for bloggers — so, bloggers, if you're interested in receiving occasional news you might want to blog about (more blinkies, challenges, special needs, etc), you can sign up for that as well. If you already got the newsletter, enter your address below and you should be prompted to change your subscription. Don't forget to help us name our eNewsletter!! We'd love to have a couple dozen names to pick from...we have some other things we might need your snazzy suggestions for, so please contribute! Thank you to all who have made and who continue to make our land free! Are you already tired of the heat? Ready for a break to cool down this summer weather? Well have we got just the ticket for you! Our dare for the next six weeks is to create Christmas cards! Yes, Christmas cards. 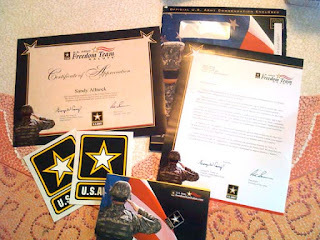 We start mailing them out to our heroes around the end of September, and last year we handled 35,000 during the three months of holiday shipping. We're hoping to spread out some of that work a little by getting some of our holiday cards in and packed up early! Entries: For each winter/holiday card you send in to any shipper by the deadline, you'll receive an entry for the random drawing. Bloggers: Help get the word out and post a blinkie or blogpost about the challenge and link it back to this thread — that will get you an extra 5 entries! (Leave a comment with a link to your blog!) We'll add more blinkies to this post for you soon, as well as more general CFH blinkies on our Resources page. The prize: A flat rate box chock full of crafting goodies!! PS If anyone would like to offer additional prizes, please email us! Bloggers: Snag this code to make the banner at left animate in your sidebar! LET'S MAKE IT A MINI BLOGHOP: Link us up! We'd love to see what you're creating for this challenge, and share ideas with others for the upcoming Christmas season. Leave a link here to your blog or gallery post on any other site, and everyone can see what you've made. 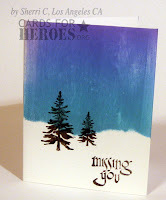 When the challenge is over, we'll post them together for a mini bloghop full of holiday inspiration! We're almost ready to send out our first official e-newsletter....and realised we don't have a good name for it! Please please please leave us your list of suggestions. We'll be taking those ideas all month and applying it to the August issue, so keep your thinking caps on and let us know your ideas! While you're leaving a comment, we'd also like to know what kind of content you'd like to receive in that newsletter...this Homefront Blog is the place to get the regular news, and our Twitter Feed and Facebook Fan Page are sources of more detailed news. But the newsletter — for some busy folks, that may be their only regular CFH news, so we're hoping to boil that down to the most pertinent things everyone would like to know. Some of our Texas crafters held a fantastic event last weekend—check out the great newspaper coverage they received! Lots of photos included in the nice cover story!